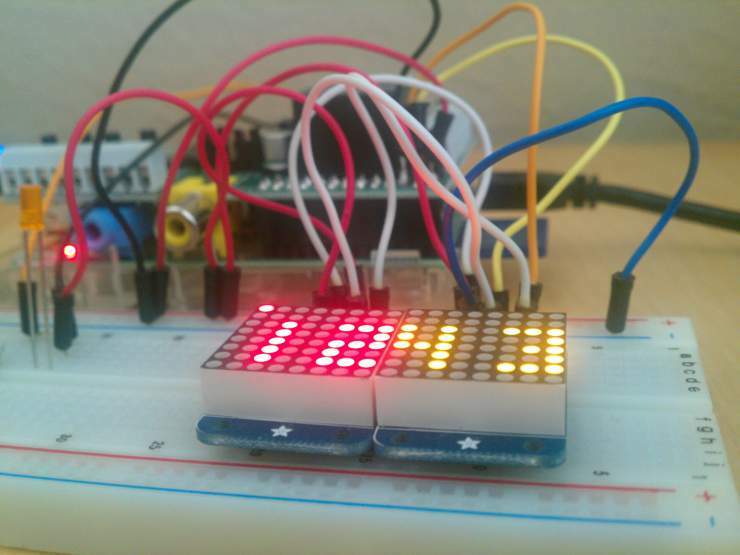 As my first RaspberryPi Project I decided to build a clock using the two LED dot matrices I bought. In addition to providing a quick glance at the time I wanted to be able to quickly tell if I had any new unread emails. Thus the emClock was conceived! My first goal was to build the clock! The two LED dot matrices I bought came with an I2C compatible interface which made set up and programming infinitely times easier than having to solder and multiplex 64 LEDs by myself. Enabling I2C on the RPI is a breeze as there are many great tutorials out there for how to do it. To access them programmatically them I used Adafruit’s LED Backpack python library. Once I created a framework for displaying the numbers, building the actual time-keeping function was easy. Once the clock portion was done, it was time to add the email checking functionality! Now, I am a Google fanboy so naturally I used Gmail, which conveniently provides an RSS feed for your emails which can be accessed at https://USERNAME:PASSWORD@mail.google.com/gmail/feed/atom. Armed with this knowledge, we can proceed to write our emailCheck() function!